Students will be able to observe, describe, and draw clouds. Have students turn and talk to a partner to share their thinking. Invite several students to share their ideas. Pause as you read to focus on the three types of clouds: stratus, cumulus, and cirrus. 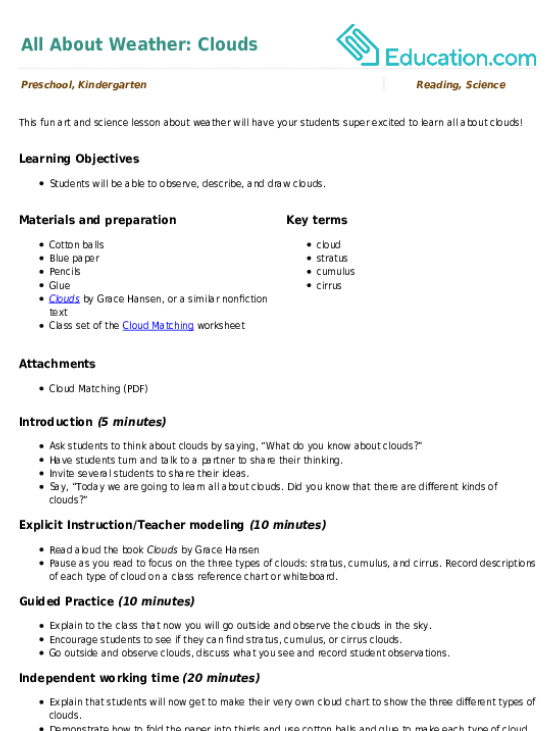 Record descriptions of each type of cloud on a class reference chart or whiteboard. Explain to the class that now you will go outside and observe the clouds in the sky. 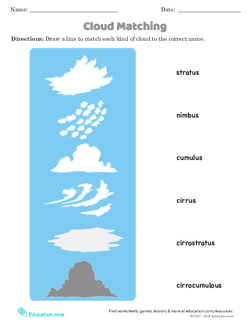 Encourage students to see if they can find stratus, cumulus, or cirrus clouds. Go outside and observe clouds, discuss what you see and record student observations. Explain that students will now get to make their very own cloud chart to show the three different types of clouds. Demonstrate how to fold the paper into thirds and use cotton balls and glue to make each type of cloud and labeling each cloud type. Pass out supplies and then allow students to complete their projects independently. Support:Have students use books and photographs to create their cloud pictures. Enrichment:For students who finish early, pass out the Cloud Matching worksheet for them to complete. Collect student work samples and assess if clouds are matched to correct name. Display student pictures and have students share the different kinds of clouds they made with class. This creative worksheet asks kids to draw and write all about their neighbourhood. This creative worksheet encourages kids to write and draw all about their summer. Kindergarteners will get handwriting practise and love sharing about their lives as they write a report all about them using this colorful worksheet! This worksheet combines the five senses with the fun and interesting topic of weather predictions!